In this article author has explained ‘Statistical Data Analysis for Buying House towards better Quality Management’. The purpose of writing this article is to show some of the difficulties that big buying houses have been facing during the past years. Supply chain in the apparel industry has become more complicated since companies have been seeking for lower cost and they have started to source their suppliers all around the globe. That brought the need for designing better control system of already very complicated supply network. 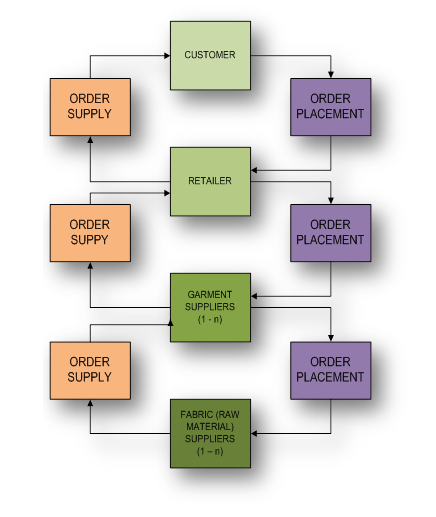 The Supply Chain in Apparel industry, illustrated in Figure-1, is comprised of its main subjects: customer, retailer, garment supplier and fabric supplier. This kind of supply chain is more or less similar with most of the apparel companies. Usually, larger size companies can have more complicated structure, especially in the garment supply segment. 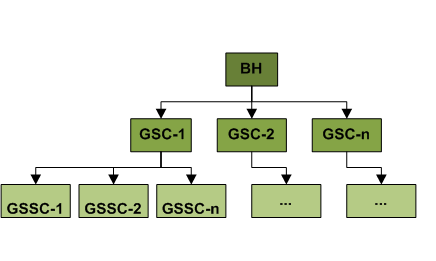 Figure-2 illustrates the garment supply in larger apparel company. Several subjects can be distinguished: buying house (BH), garment supplier –contractor (GSC), garment supplier sub-contractor (GSSC). In cases like this, where garment supply network is getting more complicated, the company needs to think of establishing efficient Quality Management System (QMS). That will ensure more systematically approach in Quality Assurance (QA), detection of causes and solving the problems for low quality. In order to have record for the QA performance of every supplier, Statistical Data Analysis is necessary to be obtained. Getting necessary data, that will describe the real QA situation in the company, can be ensured by designing sufficient supportive documentation. One of the key documents is the inspection report. Inspection report should contain information which after analysis can give clear picture for the Quality status in the company. The following table presents the most important information that one QC report needs to have. The information from the QC report can be digitalized and incorporated into the ERP system of the company. Digital version of the QC report should be able to satisfy the needs for providing the necessary information and making the work process easier. The following picture illustrates an IT solution as QA support in the company. Beside features like, attaching pictures, adding comments and generating electronic document that can be send via e-mail, the IT solution for QA support should be able to keep history records and making statistical analysis. Statistical analysis can be conducted based on the historical data from the QC reports. 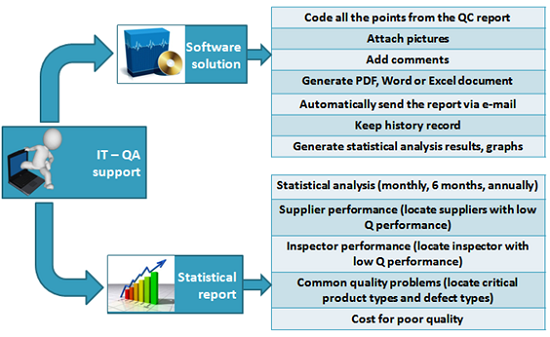 The analysis can be designed according to the needs for QA. The Statistical analysis report can present the supplier performance in terms of quality during the last 3 months, 6 months or one year. That will help the QA manager to have visual image about suppliers who have had bad performance during the last period. To know the biggest quality problems or the most problematic product types Pareto analysis can be done based on data collected from quality inspection reports. Also this kind of analysis can show the cost due to low quality (rework, 2nd choice pieces, delay). On the other side, the analysis can locate problems related to quality inspectors and their performance. An extended list of statistical analysis can be done, and it is presented in addition. You can do analysis based of last 3 months data. Following parameters can be considered while collecting data. You can use multiple forms instead of one. Later make matrices for supplier performance on various parameters. By knowing the existing quality problems, it is much easier to locate the problem causes and came up with solution for problem solving. The most important thing is that the QMS should be accepted and understood by all the participants in it. They need to follow the work standards and get the knowledge from the statistical data that can be used for problem solving and setting goals for the future. Todor Stojanov has a Bachelor Degree in Textile Engineering, and Master Degree in Quality Management. He has 4 years of working experience for C&A Quality Assurance department in Macedonia and now he is working for Zara-Man merchandise department in Shanghai- China. He lives in Shanghai -China for two and a half years and is doing his PhD degree in Fashion design and engineering at Dong Hua University.